Carve a pumpkin skull Follow along with clear, step-by-step instructions and illustrations and photographs, learn how to make a realistic human skull out of a pear-shaped pumpkin, and display it proudly to ward off squeamish visitors. You can stop there if you want, but if you find you’re interested in really going down the 3-D pumpkin-carving rabbit hole, it’s still a really good idea to develop your pumpkin skull-carving abilities: using a medium where the stakes are low, you’re practicing a foundational skill for portraiture or caricature or monstercraft or mask-making. Because there’s a skull underneath (almost) every kind of face, and that skull is going to inform all the stuff on top of it-the muscle, fat, skin, scales, whiskers, horns, warts and all. 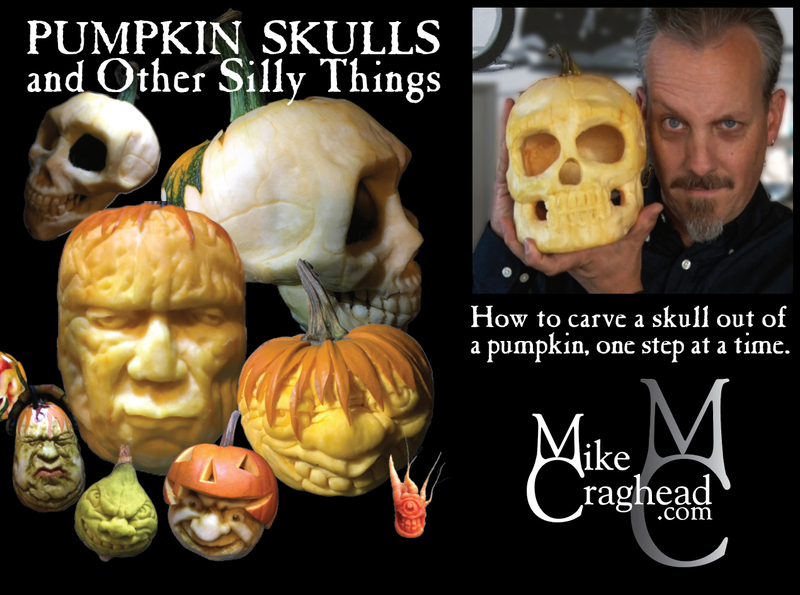 Then go beyond the skull and get some tips on how to turn any ordinary pumpkin into a realistic (or surrealistic) masterpiece, whether you’re trying to win a pumpkin-carving contest or just bringing some gruesome joke to life on your front porch. If you can get your hands on the right tools and a great pumpkin, this book just might help you execute an idea that’s sufficiently weird to justify squandering your valuable time on something that’s destined to become mush. But first it just might make someone smile. Or vomit. And that, dear reader, is a truly noble cause. You can follow the the Amazon links above, but in case they don't show up for you, here's the print version, and here's the ebook.